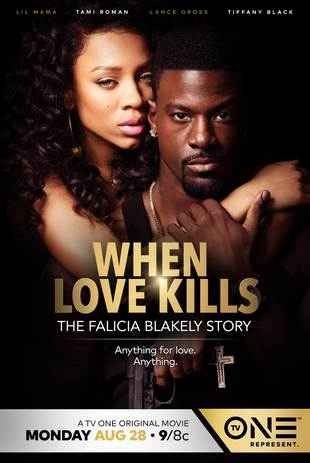 TV One looks to have a solid hit on their hands with their film, When Love Kills: The Falicia Blakely Story. The movie follows former stripper and single mother, Falicia Blakely (Niatia ‘Lil Mama’ Kirkland) and her tragic and shocking love tale. EURweb attended the Los Angeles red carpet premier and the stars were there as well to show support. In the audience we saw Angela Bassett, Tisha Campbell-Martin, Vanessa Bell Calloway, Loni Love and Essence Atkins just to name a few. The films’ all-star cast was in attendance too. Lance Gross popped on the scene is his fuchsia suit, ready for us to see a side of him that we’d never seen before. Gross, by the way, portrays the film’s antagonist Big Dino and to describe his performance as stellar may be an understatement. Gross’ former roles as the likeable, nice guy are no match for the manipulating womanizer that is Big Dino. Gross is grateful for the film’s director, Tasha Smith, for the opportunity. “I’m fortunate because Tasha has been my acting coach for years and she’s seen performances out of me that no one has seen. So she believed in me. She gave me a call,” says Gross. Rapper/actress Lil Mama, who is now going by her legal name, Niatia Kirkland, put on a performance of a lifetime. Her confidence was ever so present on the red carpet as she donned a lovely white gown. The queen of the night she was indeed as the audience witnessed her convincing onscreen transformation into Falicia Blakely. It wasn’t all that easy for Kirkland. It was quite a challenge for her. “I play an exotic dancer and that was something I was very fearful to play. That’s an element of acting that I didn’t understand; not judging the character.” Niatia tells us. TV One issued a PSA about domestic violence in conjunction with the movie starring the movie’s stars. When Love Kills: The Falicia Blakely Story premiers on TV One, Monday, August 28 at 9/8c. He use to be married to Teka Sumpter the woman who play “Candance” on the show The haves and the Haves not”. Amber, I did not know that, I knew him and Eva Marcille dated or something at one time, but never heard about him and Teka, interesting. Are you serious? I believe you, but that’s something your first response is, I cannot believe that. Is that for me Barb in my first comment. Blacks can still marry blacks then turn around marry/date lighter or white people and then start making bias comments towards their own black/darker people. Look at some comments Lil Wayne have made as well. His wife is mixed. Her dad is blk. Yeah, very light, but not white. I will not watch this movie because I do not like Lance Gross. He made an degrading statement about BW and that did it for me supporting/watching anything he’s playing in. Barb, what did he saw about BW. Please tell us….. I cannot remember what he said, but it was in response to a photo he posted on social media of him, his white baby momma and all his black friends that are dating or married to WW. There was a BW in the photo without a mate. I think I remember that Barb. It seems like it was a Christmas photo or something like that. Yes, it was. The internet blasted him for his comments. I did not like that Christmas photo either. Yet if a white hate group shows blacks in that manner, I bet Lance would be the first to be mad YET he did it. Sometimes some blacks can be worst than white hate groups in putting down blacks.